Forget fumbling with keys. And, unlike locks with RF chips that make you swipe or tap for entry, this lock from August works with Bluetooth LE to detect your presence. 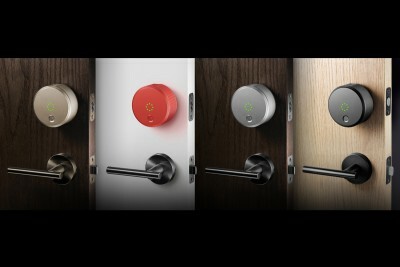 August, the brainchild of Yves Behar, whose work with famed partners Herman-Miller, Soda Stream and Jawbone to name a few; and Jason Johnson, a Silicon Valley technologist and entrepreneur; consists of an attractive smart lock device that installs on the interior side of existing deadbolts paired with a mobile app that allows authorized users to access the property. If your phone is typically dead at the end of a day, you’ll be glad to know that the existing deadbolt can still be unlocked with a physical key, and the lock can still be opened and closed by hand from the inside. The August runs of 4 AA batteries so it continues to work even when the power goes out. 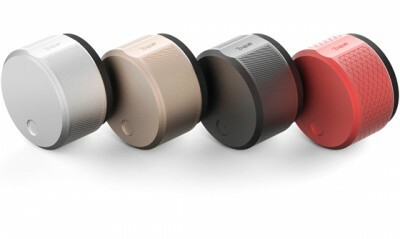 The lock comes with both a mobile app and a web app, so it can be used with all Bluetooth-LE-enabled iOS and Android smartphones. You can grant keyless access to friends, family and visitors by inviting them through the app. You can grant keyless access to friends, family and visitors by inviting them through the accompanying app. You can also customize which days a person has access to your home, even during which hours, and revoke access whenever needed. You can further customize what days a person has access to your home, even during what hours, and revoke access whenever needed. The app also logs the time and date each user enters and exits through the door. This level of detail is handy especially when it comes to managing hired workers like dog-walkers, cleaning companies or service technicians. You are able to see whether they showed up on time, and how long they actually stayed in your house. If you are worried about the security of the lock or if you lose your phone, the August team has set up a way to lock the app and wipe all virtual keys. The lock is also encrypted, making it more difficult to hack. According to Johnson, the locks do not associate with specific addresses, so it is nearly impossible to associate a digital key with a specific door, should somebody else gain access to your phone. As for the social aspect, the August app also includes a Guestbook function, which lets people leave comments and photos for their guests or hosts. This could be especially useful if you’ve listed a room or apartment on Airbnb. As soon as somebody enters your home, the app can send them a welcome greeting with some tips on the house and neighborhood. Guests can also leave “Thank You” notes through the app. Currently, the August is available for pre-order for $199. 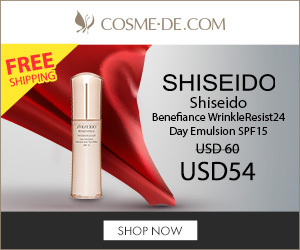 It was originally slated to ship in early 2014 but no updates have been given. It looks as though orders are strong as new orders today are scheduled for the second production run. Philips’ hue lighting system is gaining two new components, a hue lux remote-control white bulb, and the hue tap, a clever little switch which makes controlling your favorite Hue light scenes even easier. And, since it’s kinetic-powered no batteries are needed. The new hue tap is built on Philips’ hue wireless lighting system, which has grown from the original iOS app-enabled, color-changing LED bulbs to an ecosystem of smart lighting accessories. The tap is the first official product from Philips to bring hue lighting control out of the app and into the physical world. Philips Hue tap needs no batteries as it operates using kinetic energy – simply through taps from your finger. As a result, it has a remarkable zero watts of power consumption and needs no main power source. Meaning it’s not only smarter, but greener and hassle free. Philips Hue tap control requires the hue bridge found with all starter kits for Philips hue and Friends of hue products. Hue tap will be available this fall for $60. 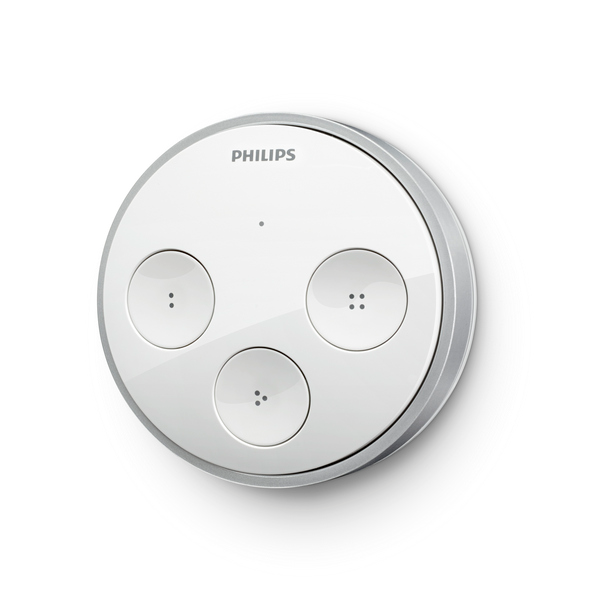 Interestingly, Philips will open the hue tap API to third-party smart home developers. That potentially means easy installation of a multi-function switch that could be mapped to multiple different home automation products, addressing a common request in the growing smart home market. 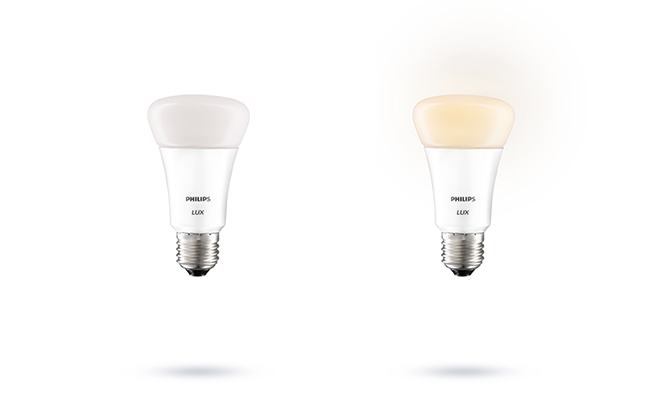 Philips has also introduced a new bulb called the hue lux, and it’s dimmable like the other hue bulbs (and other smart bulbs) but doesn’t do the chameleon color changing of the original bulbs. The lux bulb has a max lighting output of 600 lumens and temperature range from 2000-6500 Kelvin. Philips estimates hue will last 15,000 hours while drawing up to 8.5 watts at full intensity. Hue lux works on the same ZigBee protocol, meaning users can incorporate the lights with third-party sensors, that the original color-changing hue bulbs use, but changes through white light intensity instead. Philips says lux will go on sale this fall at a price of $39.99 each or $99 for a two-bulb starter kit that includes the hue wireless bridge.